Save an extra $0.64 when you choose FREE No-Rush Shipping at checkout. Poolmaster's Essential Collection consists of the must-have products for customary pool and spa maintenance constructed with durable materials designed to keep your pool sparkling. 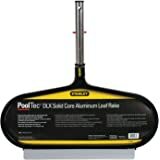 Compact for storage and easy to extend, Poolmaster's Telescopic Leaf Skimmer is a great grab-n-go maintenance tool to have on hand. Sturdy molded frame protects pool or spa surface from scratches. Collapses down to approximately 4' and fully extends to approximately 8-feet. Since 1958, Poolmaster has been a leading manufacturer of aftermarket pool and spa products with an unwavering commitment to quality, service and reliability. Poolmaster offers products across six different product lines- Backyard and Decor, Inflatables, Floats, Maintenance, Swim and Dive, and Toys and Games. Poolmaster - We Make Water Fun! 1.0 out of 5 starsPicture isn't accurate for what you get! 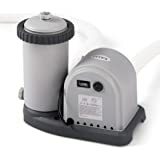 I thought this would be a great deal for a combination of skimmer and 8' pole, which would have been completely long enough for my small indoor pool/hot tub. The picture appeared that the skimmer could be detached from the pole, thus allowing me to use other attachments. When it showed up, the skimmer was RIVETED to the pole, thus making it impossible to swap out for other tools. Not at ALL what was represented in the photo, and a huge disappointment. I returned it immediately and ended up buying two separate items at an, unfortunately, higher price point for the two combined. 5.0 out of 5 starsThis is a great product. 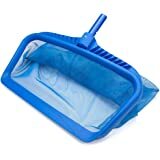 I bought this item to help clean the bottom of my koi pond. I was using a cheap 1980's pool skimmer before and thought I would "splurge" on a fancy Cadillac verson. This skimmer has cut my cleaning time in half and actually gets everything off the bottom. The netting is pretty fine so it traps small debris and the scooping edge scoops up so much more than before. The item is very sturdy and I also love how it collapses down. In my opinion, it was a great purchase. But I'm skeptical it's going to last. The thin aluminum tubes (and mine is blue, feel a little fragile and they bend when extended to anything over 6 ft. and act as if they are about to fall apart. And so does the plastic frame to which the net is attached. I hope it will last for the season but I don't believe it's going to survive two seasons. By comparison, the skimmer this one is replacing was a lot more solid and only needed to be replaced after four seasons because the net broke. Sadly, Amazon no longer sells it. I will update this review and add a star if it lasts for 2 seasons or remove one or 2 if it breaks earlier than expected. It only took 2 days of actually using this for it to break apart. As I was afraid, the thinnest segment separated itself from the rest and it was bent to the point that it's impossible to attach. It turns out that the 'tubes' are made of the thinnest aluminum and they won't stand any stress beyond maybe taking a leaf or two or a couple of dead bugs out. 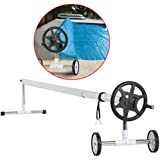 It may work in a small pool but if yours is large - which is what this claims to be for, extending to 8 feet - do not buy this one, or disappointment will follow. 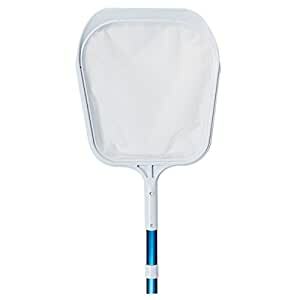 I did like the weight, and it worked decent for a month or so and then the handle became dificult to adjust and the net started to separate from the frame. I have had much better quality lighter weight skimmer nets that held up way longer than this one. 3.0 out of 5 starsFlimsy, just ok.
it works for skimming a few leaves at a time from the pond surface, so i guess it works as advertised. But, don't try to scoop anything from the bottom or anything with much weight because the telescoping handle comes unscrewed, feels pretty flimsy. I was also hoping for a finer mesh (to scoop out occasional pond foam). 5.0 out of 5 starsPerfect! With no reviews on this prior to purchase, I was a bit worried it would be flimsy. No problem at all! Well made and sturdy. Handle easily extends and will work great. 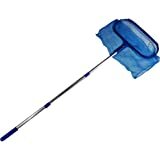 Great mesh skimmer...perfect replacement with a great price. Does arrive in a huge box! Last minute decision to buy another pool, couldn't find a skimmer for the life of me... Skimmer, but no pole. Pole, but no skimmer. Sold out on skimmers. Found this one for $20 on here... Great deal from what I saw in stores. Showed up in 2 days. Undamaged. 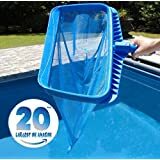 Works great for 14 ft summer escapes above ground pool. Telescoping pole not a necessity for me, but nice added bonus. Despite what some of these reviews say this skimmer is actually very sturdy. I'm pleased.